While Baltimore may shock you with how expensive the average wedding costs, that doesn’t mean you have to sacrifice your dream location. This is your big day and it should be personalized to meet what you have been dreaming about for so long. Baltimore is the home of unique and gorgeous landmarks. While it is a busy city, there are tranquil spots that provide a nice change of pace from the hustle and bustle of the city. 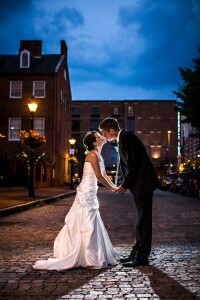 From cobblestone streets to historic facades to the history of Baltimore itself entangled in every aspect of the venue. 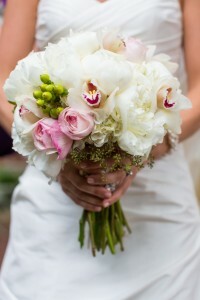 Your photographer will not have trouble finding the perfect place for your pictures. There is something for every age group and all interests. History, art, museums, Fed Hill, Canton, sporting events, parks, family activities – Baltimore is far from boring. The best part is that you can pull elements from your favorite parts of this beautiful city and incorporate them into your wedding! 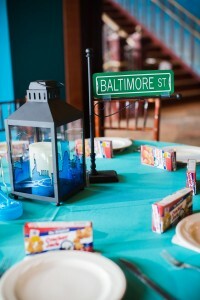 Speaking of incorporating Baltimore into your event, give a little piece of Baltimore to your guests. Here are some ways our past couples have shown their Baltimore pride in decorations and favors. 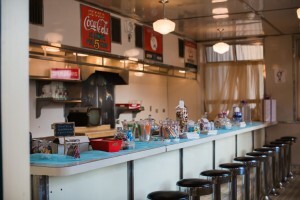 Great news, the 1840s Plaza has everything you could want and more in a venue. It has so much character and shows a little piece of Baltimore in each and every floor. From the murals of the fourth floor Ballroom to the White Tower Diner on the second floor City Lites to the historic Fava building facade from the 1840s, our venue is Baltimore. Make an appointment to take a tour of our venue and let the 1840s staff show you why our Baltimore venue is the perfect place for your wedding.